Sheet Metal Welding for Precision Components Available from ELO Engineering, Inc.
ELO Engineering, Inc. has been a provider of sheet metal welding services to companies nationwide since 1972. 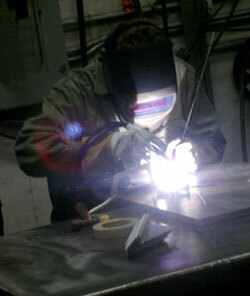 We have experience and equipment for welding aluminum, stainless steel, and CRS. In addition to our traditional manual welding capabilities, our company has made significant investments in robotic welding equipment which allows us to efficiently produce high volume orders. Whether you need frames or chassis for medical equipment or other complex assemblies, you can trust our experienced team of manufacturing professionals to deliver high-quality precision components within the tolerance your project demands. Unlike many other sheet metal shops, we’re a precision sheet metal forming, fabrication and welding company capable of tolerances +- 0.010. We are ISO 9001:2008 certified and AS 9102 compliant and constantly track metrics such as PPMs to ensure we’re producing parts with the critical dimensions our customers need. Using lean manufacturing principles and many other industry best practices, our staff will ensure efficiency and quality throughout the entire production process. Precision welding is just a small part of what we do at ELO. Our specialty is delivering turnkey solutions that save our customers time and money. In addition to having millions of dollars worth of modern production equipment for many types of sheet metal fabrication, we have an expert staff of machine operators, engineers and quality control professionals. From prototyping and engineering support through special finishing processes and finalcomponent assembly, ELO can manage your entire parts program, saving you time and money. Plus, thanks to our precision, strict quality control and use of integrated production forecasting, we are able to ensure our customers receive their parts on-schedule. For more information on our sheet metal welding services, or any of our other capabilities, contact ELO Engineering, Inc. today.